The beauty of having an Android device is that the community is always up the task of fixing these types of shortcomings. Famed developer Francisco Franco has came out with a replacement kernel for the OPO which, among other things, forces AC-charging. This does require you to flash a file in TWRP, so an unlocked bootloader is a must. Also, this is only compatible with CyanogenMod 11S, which means if you switched to Color OS or regular CyanogenMod 11, this hack will soft-brick your device. Be warned. 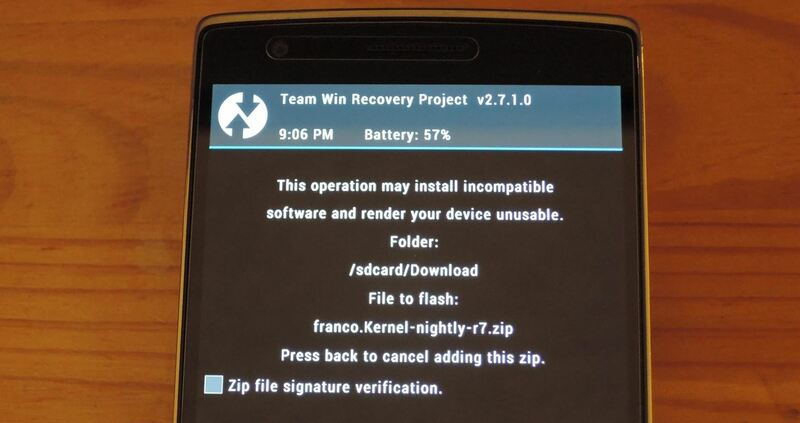 Download the Francokernel.zip file directly to your phone's storage, and once it finishes, boot into recovery. If you have Advanced Reboot enabled from Developer options, you can select Recovery as a boot option from there. Once TWRP starts up, tap Install and select the .zip you downloaded. Wipe the Dalvik Cache and Cache once the install finishes, then reboot. Now whenever you plug your device into a wall-mounted outlet, it will automatically switch to AC charging. My average charge time is roughly 2 hours to get from 5% to full. The kernel is updated often with more speed and power optimizations, so be sure to check the XDA thread every few weeks to say up to date.